I am one of the crazy people (idealists?) who started Chefsteps, and if you know anything about ChefSteps, you will know that I am well-acclimated to sous vide. According to some, sous vide makes the perfect steak (though my perfect steak is grilled by my dad on the back porch), and it works wonders for batch-cooking burgers. For me, sous vide’s biggest benefit is looong, slooow cooks in tiny, hot kitchens. Since my kitchen is both tiny and hot, and since I don’t have access to an outdoor cooking space, sous vide is a life-saver when I want to turn rubbery octo-legs into chewy, but not too chewy, perfection. 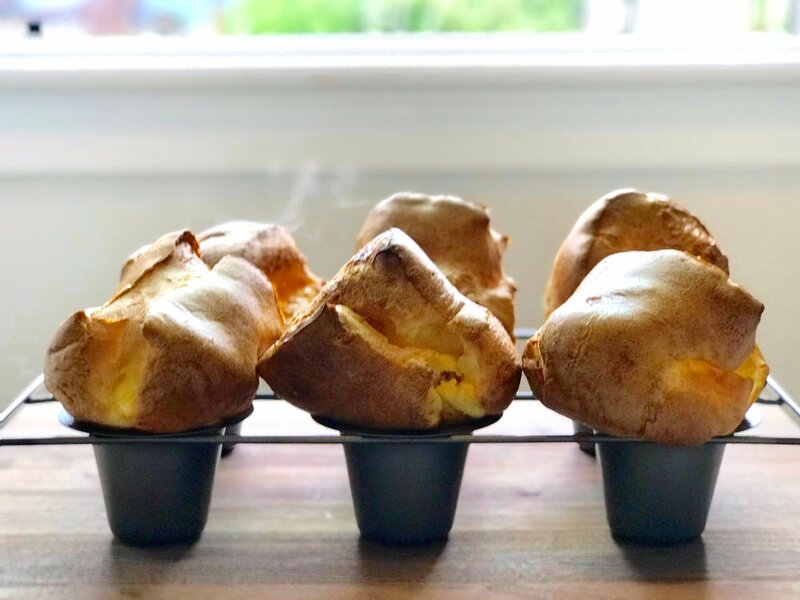 I slow-cooked these badboys for 24 hours—plenty of time to convert tough to tender—and (another great sous vide thing), it’s totally hands-off. But enough about sous vide! 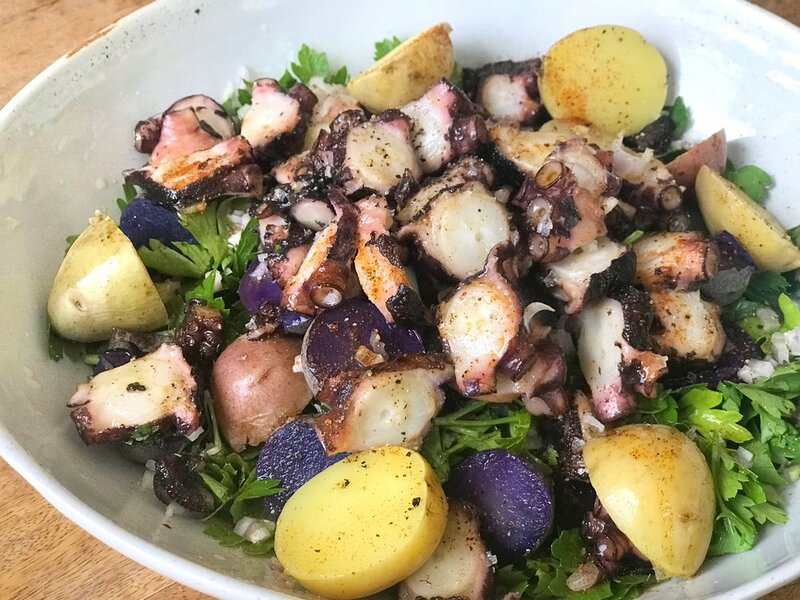 For this delicious basque-esque salad, I pair those pretty purple legs with some sliced new potatoes, tons of fresh, flat-leaf parsley (PS: parsley as a salad base is my fave), and a healthy dose of paprika and cayenne. 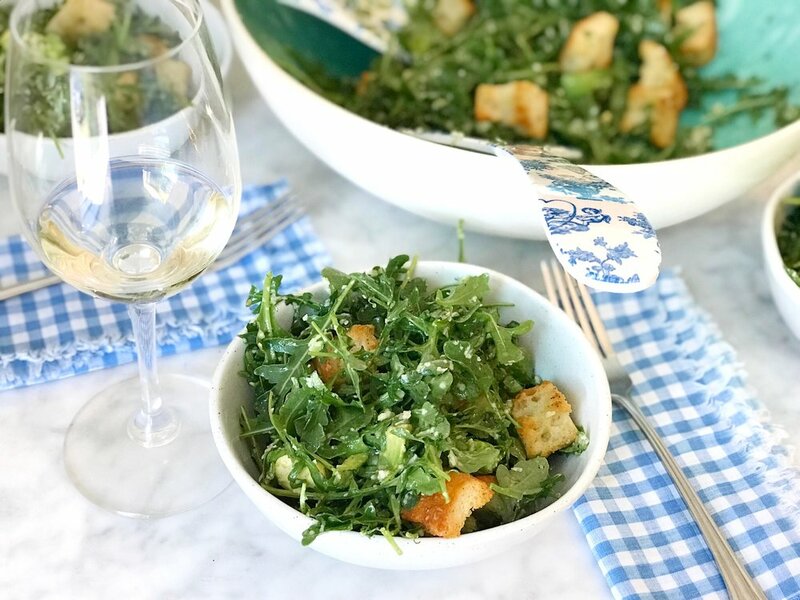 It’s all tossed in a simple lemon vinaigrette, and finished with some flaky salt and fresh pepper, for a Spanish-inspired salad that has (almost) nothing to do with sous vide. Make this Spanishy masterpiece at your next dinner party, and all your guests will go, "Sorry, what? You made OCTOPUS?" And you will say, "That is correct." The key is this: Patience. There’s no way around it—octopus needs time to tenderize. This recipe calls for a 24 hour cook, but you can also do five-hours at 170F, according to ChefSteps. (Check out the "Olive-Oil Poached, Grill-Finished Octopus" guide in the Joule app, which is free in the app store even if you don’t have Joule.) Either way, even when it’s done cooking, it’s best to let it sit in some dressing to soften up even further. PS: If you simply will not cook sous vide, you can do the octo-legs another way, and still make the same salad. Braising, InstantPotting, pressure cooking, and smoking are all good options. Google around to find the technique you want, then toss ’em in the salad just the same. Blanch your legs in a pot of boiling water for about five minutes. The legs will curl up and get real purple and stiff. 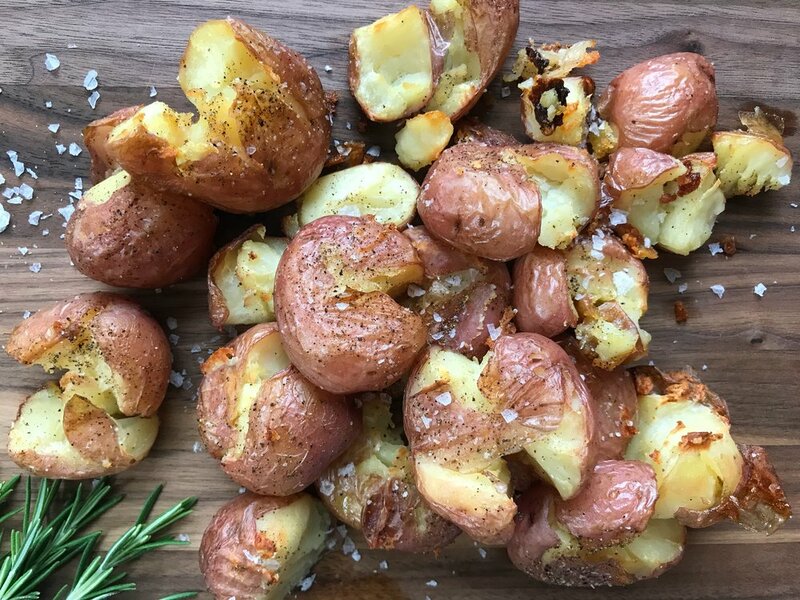 Boil those potatoes until they’re fork-tender. Try really hard not to overcook them—it’s important that they’re firm, not dry and starchy. Pull them out of the water and let cool. Then, slice them in half. Combine lemon juice, olive oil, and shallot in a large salad bowl. Whisk to combine. Add salt and pepper to taste. Slice up the octopus legs into 1/4-inch chunks. Add to the dressing, and let sit for up to 30 minutes. The acid in the lemon will further tenderize the octopus. Add parsley, cilantro, potatoes, paprika, and cayenne, and toss. Add salt and pepper to taste. Serve! Buying octopus sounds terrifying. How will I know what to say?! Don’t stress! Tell the fish monger you want twelve ounces of octopus, or about four legs. He’ll likely give you a wiggly, grey blob of stuff in a bag, but don’t be deterred—when you blanch it in the first step, it’ll firm up and look more like Ursula. It also doesn’t matter if the legs are whole—you’re going to slice them up anyway—so you don’t have to be too picky about what it looks like at the store. Where do I even buy octopus? I get mine at Pike Place Market (Pure Food Fish, to be precise), so if you have a local fish market you like, try there first. Otherwise, Whole Foods or another specialty grocery store will probably have it. I’m having octo-drama and I can’t find any! Can I use something else? Sure! We think smoked trout would be pretty delicious, or just a can of olive-oil-packed tuna. Or shrimp! Sous vide? I thought this blog was about approachable home cooking. We think of sous vide as a pretty normal cooking technique (you probably spent way more on your KitchenAid or Vitamix than you will on Joule or Anova). So, we are going to use it when it’s the best tool for the job. For octopus, it’s great; for potatoes, not so much. I don’t have a sous vide but I must make this TO-NIGHT. CHYES! 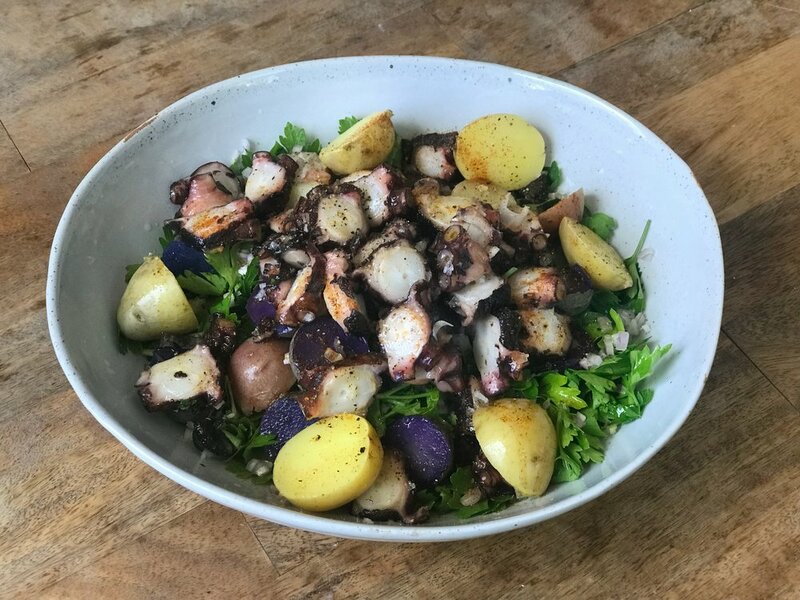 The octopus-cooking step is pretty separate from the salad, so you can do the octo-legs another way, and still make the same dish. Braising, InstantPotting, pressure cooking, and smoking are all good options. Google around to find the technique you want, then toss ’em in the salad just the same. I have so many more questions about sous vide. Cool, go ask the nice people at ChefSteps. Or Serious Eats.